The girls of Dreamcatcher are... well, a nightmare. Not in a bad way, though: they were cursed that way. As opposed to indulging in the typical trappings of bright and bubbly girl group pop, the seven member South Korean troupe does things a bit differently, serving up slick choreography set to the furious sound of screaming guitars and crashing drums. The concept of pairing rock music with a squeaky-clean troupe of singing-dancing sensations isn't entirely new; Japan's BABYMETAL has made global waves over the past years with their own charming "kawaii-rock" style. But rock is a rarity in the mainstream Korean music scene, which is part of what makes Dreamcatcher's flavor so unique. Their visuals are also strikingly different than your average girl group imagery. Rather than competing over who can serve up the cutest kissy faces in pastel-hued videos, the girls of Dreamcatcher are trapped in some kind of haunted Hell, with each member representing a different nightmare, all while dancing through their terror. (This is still K-Pop, after all). K-Pop has never looked or sounded quite so ominous. Your music and visuals are very refreshing. What do you think makes Dreamcatcher stand out? Many people say that they've never seen a K-Pop girl group like us before, and we're always proud of the fact. There've been girl groups that have tried rock music, but they didn't form their group's identity with metal rock like us. In addition, we deliver powerful dance moves which add to the synergy. The most interesting thing about Dreamcatcher is the fantasy story of the "Seven Nightmares." It's not simply one series in a big frame, but organic stories created with each single and album. Also, there are clues and hints to solve the mysteries, so not only do the viewers focus on the music and the storyline, but they can have fun with their own interpretation. We think those aspects make Dreamcatcher different and stand out from existing K-Pop artists. What inspired this rock sound? Do the members like rock, and will there always be a rock edge to their music, or will you try new styles? Contrary to other countries, it doesn't seem like rock is a popular genre in Korea. There are famous artists who are in a rock band, but it's a fact that the genre isn't influencing the music charts as mainstream music. However, rock's charming points are endless. We focused on the synergy that combines the intense sound and rhythm of rock with the mainstream K-Pop sound. All of the members fell in love with rock, and one of our members Siyeon was a vocalist in a school band, as well as a huge fan of Japanese rock band, ONE OK ROCK. We talked amongst ourselves, along with our label, Happyface Entertainment, about what type of music we should pursue. One thing for sure is that we don't only focus on rock. We don't have a specific timeline, but we'll definitely show that we can do many different types of genre in the future. The music video for "You & I" provides many clues to the back story of Dreamcatcher, like your other releases, including the introduction of a scary spider woman. Can you talk about the concept of the latest music video? The latest music video follows the story after the escape from "Good Night" nightmare hunter. We arrive at a photo studio following the pursuit, and as we take pictures, we have a little fun by entering their dreams. One day, the spider woman who cursed Dreamcatcher with a nightmare came by. As Yoohyeon takes her photo, she disappears into thin air. 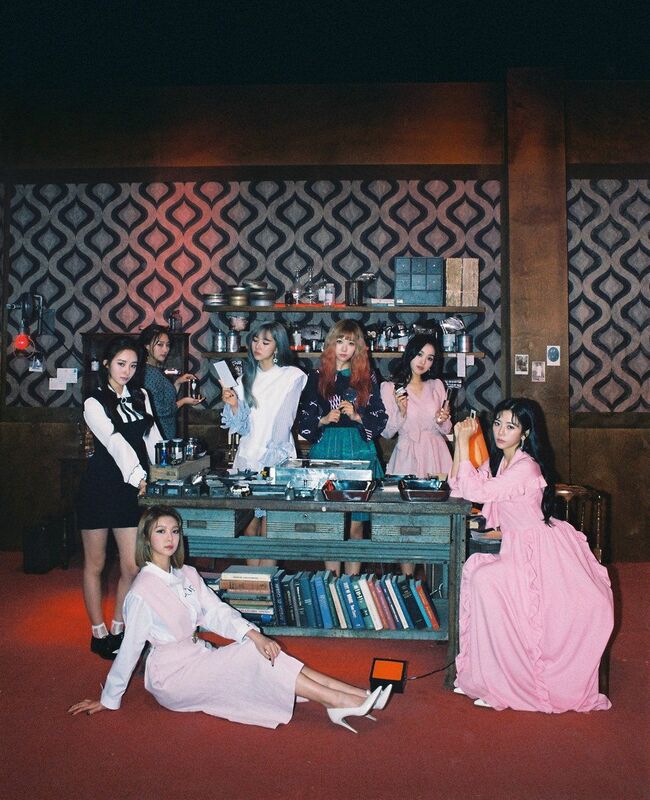 The music video shows the Dreamcatcher members trying to rescue Yoohyeon from the curse - but they're eventually unsuccessful at saving her. We know that the girls represent different nightmares, but the storyline is still unfolding. Can you elaborate on this? Since all the stories of Dreamcatcher haven't been released, we can share too much information. In that regard, we wanted to say that Escape the ERA is the break in the nightmare series, and that it has an open ending. The story of Dreamcatcher is intended to draw a bigger picture than what we can express. We want to make it fun and interesting for our fans to make their own unique conclusions on what's happening through the hidden hints and clues of teasers and music videos. We think one of the ways to enjoy the story is to compare the different interpretations of Dreamcatcher stories. What is the meaning behind the name of your latest EP, Escape the ERA? Exactly like the title, this album is an escape from an era to finish of the Nightmare series. We've shown different types of nightmares, starting from the first single "Chase Me" to the six others in the series, but it was time to take a break from the topic and develop something new. It's also another way to show you a preview of our new stories ahead. The visual concepts are much darker than the stereotypical cutesy K-Pop girl group. Do you worry at all about alienating the opportunity for younger fans, or was the plan always to reach a more mature audience? It could be somewhat terrifying or dark depending on the way it's expressed, but we didn't target any specific group. We can't share too much, but you'll be able to see different aspects of Dreamcatcher in the future. Which specific artists do the group draw inspiration from? Many people compare Dreamcatcher's music to J-Rock and anime theme songs. We didn't have any artists specific in our mind when the group was created. but there were a few mentions of Babymetal to understand our group. As for now, rather than drawing an inspiration from other artists, we're doing our best to focus on expressing our uniqueness and be one of a kind. You toured Europe to meet with fans from all over before releasing a debut album, from London to Paris. How was that experience, and what did you learn as a group on the road? What was the biggest challenge of touring together? We challenged ourselves on a world tour after finishing the first two singles, and we were so surprised to find that many fans around the world enjoy Dreamcatcher's songs. We're grateful for everyone who was involved in making our tour possible. Even though it was physically burdensome traveling to different parts of the world in such a short period, we were supported by fans who love and support us. It was truly a memorable experience that made us feel more responsible as artists, and to give back the love with a great performance. You also just announced a Latin American tour as well. What are you hoping to see and do in Latin America? The first time that we met Latin American fans was during our first four-city tour in Brazil But until then, we had only ever heard of the enthusiastic fans. This tour was possible through My Music Taste, and we're already excited to see all the passionate fans waiting for us. We're preparing a lot of great performances for this tour, so we hope to have a fantastic time with our fans. What can fans expect from the live Dreamcatcher experience? Fans will see things that they can only experience live. We want to hear "Dreamcatcher's performances are the best live!" Not only do we want to perform, but we want to engage and make memories with our fans through different events. We hope to see you there! How do you connect to international audiences who may not speak Korean? We're actually learning different languages! As much as we have fans all around the world supporting us, we really want to communicate with them. We're promoting our album right now, so we don't have too much time. but we're studying hard during our spare time. We can't be perfect but we're doing our best. You finally settled on "InSomnia" as the name of your official fan club. How did you make that decision, and what does it mean to you? 'InSomnia' is a compound word for 'Somnia' in Latin, meaning 'dreams,' and 'In' in English expressing the situation of something that is enclosed or surrounded by something else. We wanted a name that expresses our wish to be with our fans in dreams. We, Dreamcatcher, lose our meaning of existence without our fans' love. With our fans who made us be here today, we promise to always try our best to be the proud Dreamcatcher for you guys! Dreamcatcher only debuted a year ago. What have you learned so far about the realities of being a girl group member? As we go through this interview, I don't think we can ever stop ourselves from mentioning our fans in every question. For all seven of us, the last one year with our fans has been a continuation of the most beautiful and incredible moments of our lives. We are sincerely grateful for receiving so much love and support from fans all over the world. We want to continue making lovely memories with our fans! What's in the future for Dreamcatcher in 2018 and beyond? If we could fast-forward many years later, what would you hope Dreamcatcher has accomplished and is known for? We want to get more love from fans worldwide, so we're determined to try harder. We hope to spread happiness, and be known as not just the best, but a group with a unique color. Until then, we'll do our best to make 'InSomnia' proud.